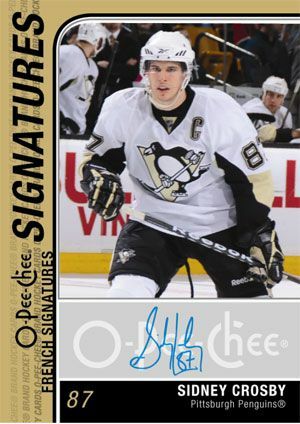 One of the largest sets of the year has been released - it's O-Pee-Chee hockey! Is bigger better? What can collectors find in this massive release? This year's OPC base card is very pleasant to look it. There does seem to be a lot going on at first glance, but the elements of the card work together so well that the card doesn't seem busy or overcrowded. And I really like the baby blue border. This light shade of blue softens up the card and helps impart a retro feel. Though this card is definitely modern in design, the blue reminds me of vintage sets that used softer color pallets. Upper Deck is obviously going for a retro feel with this brand, and they design geniuses over there were able to put that hint of vintage into these slick base cards. The front of the cards have all the basic informational needs presented in a clean way. 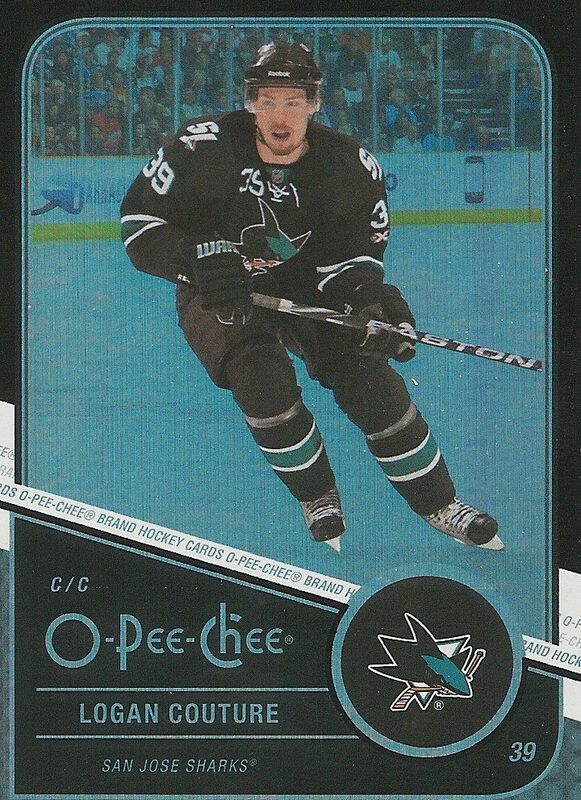 The OPC brand is featured prominently above the player's name as well as in a slanted bar across the bottom of the card. I love that slanted bar for some reason! Very cool. The photos are passable, but are not nearly as spectacular as those found in Upper Deck Series 1. 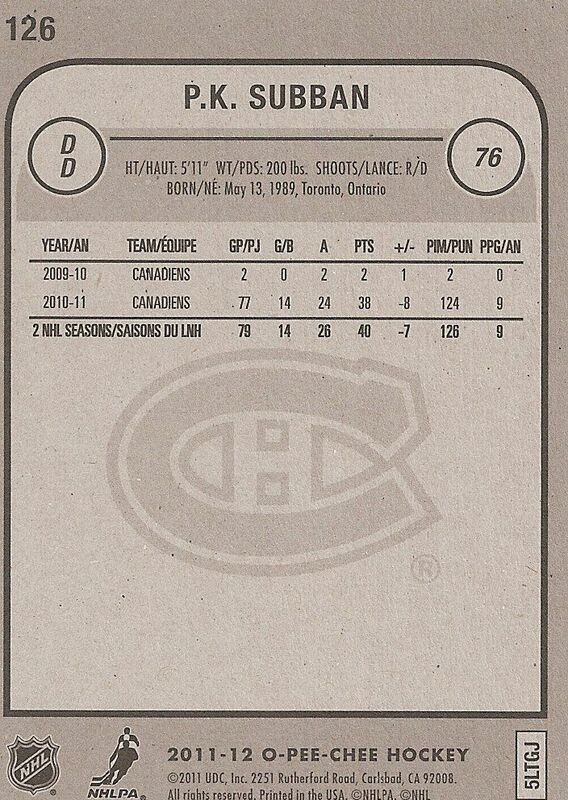 The backs of the OPC base cards are plain, but feature the required amount of statistical information. Unlike many modern base cards, these do not feature any color or photos. They share design elements more in common with their 1980's OPC brethren. I do wish, however, that there was at least a little paragraph written about the player on the back. This would have been a very time consuming undertaking for a set this size, but I think it would have been nice - especially for younger collectors who might take the time to examine their cards closely. Similarly to Artifacts this year, OPC has subsets within the base set that feature the same design with a different color scheme. 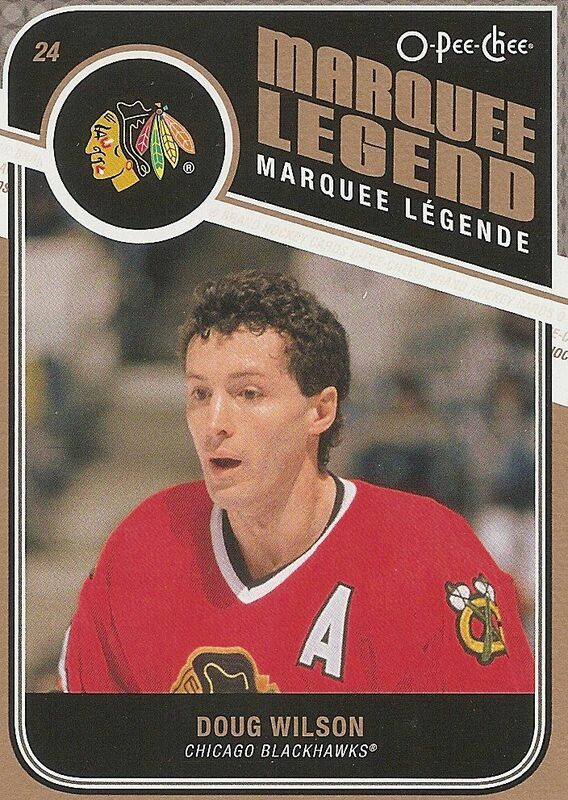 The Marquee Legend subset features stars from the NHL's past. The design is actually a vertical reverse of the standard base card. Interesting. But the color choice and logo just don't do it for me. These cards seem a bit uninspired and boring. The backs of the cards display the full statistical information of the player's career and look pretty much identical to the backs of the base cards. The rookies share the same design as the Marquee Legends but have a livelier green color highlighting the cards. The look is slightly better, but the overall design is still weak. 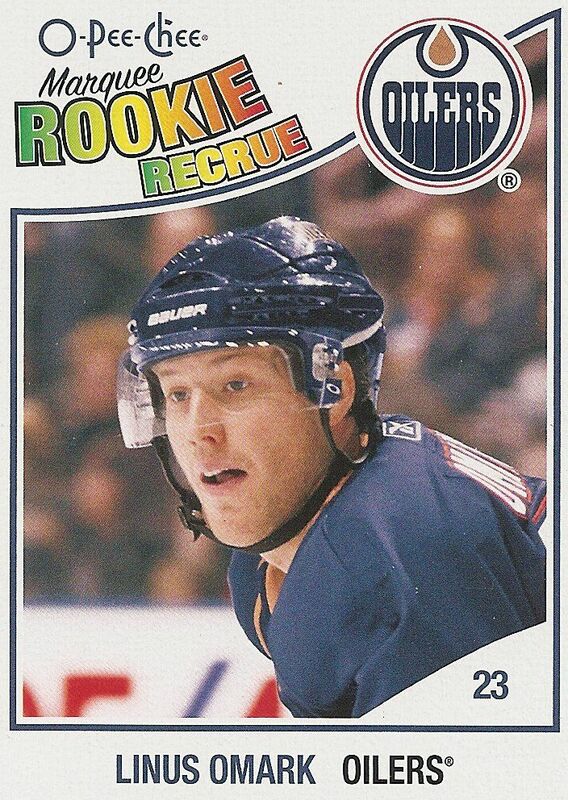 OPC rookie cards have never featured stellar designs, and the trend continues here. The backs of the rookie cards are well done though. The draft information about each rookie is prominently featured and there is a short write up about the player in both French and English. Nice! OPC is a product that features the chance at getting autographed cards, game-used memorabilia cards, as well as a variety of inserts at a very nice price point. 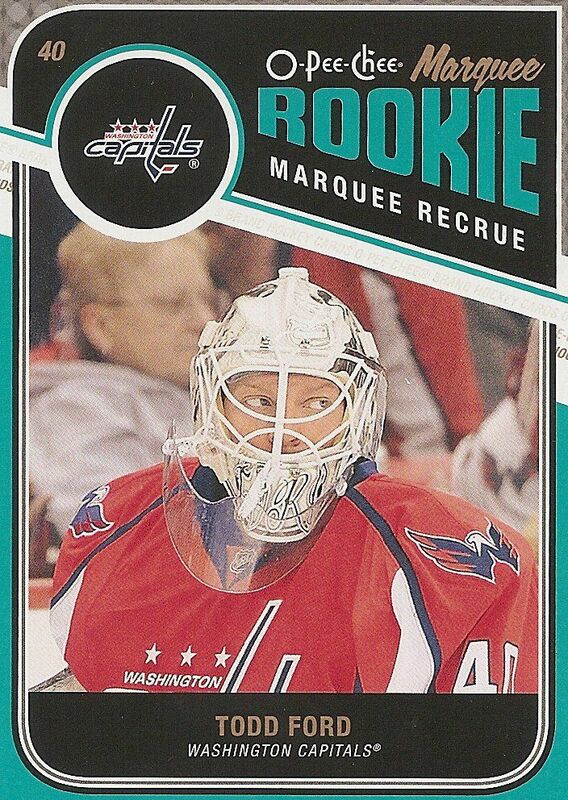 One of the inserts this year is interesting because it is an extension of last year's set. Last year Upper Deck was going to produce a stand alone update set featuring rookies that did not make it into 10/11 OPC. That set got cancelled. Instead, you can find those cards here in these packs This is great for collector's who want as complete a set that you can get to add on to their set from last year. Interestingly enough, you can also find the retro design from last year of these players as well. I was surprised to pull one of last year's retro designs in my box. Speaking of retro cards. The retro parallel set is back... and it looks great! These cards are extremely retro in design - they sort of look like old playing cards. I have already heard collectors saying how much they enjoy the retro design this year. 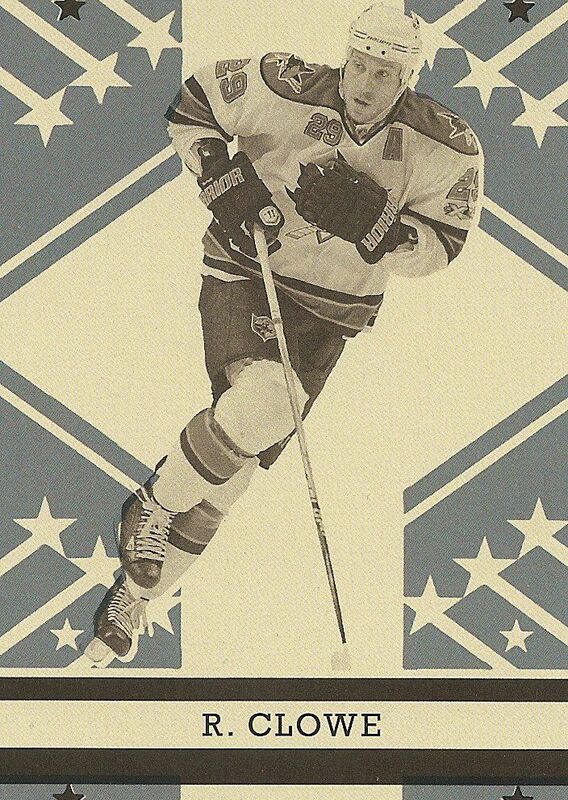 The retro cards feature a simple star background with a black and white photo of the player on the front. You will find the player's first initial and last name only on the front with no other information. The backs are very sparse as well. Very little information to be had there. And if you're lucky, you may even get a blank back card - a card with literally no information or anything on the back. The blank back cards provide a very challenging chase for collectors. Upper Deck did not officially announce the blank back cards... but they are there! As they did last year, Upper Deck also inserted foil parallel cards of the base set into packs. There are both non-numbered and black bordered (#'d to 100) versions of these cards. It's a nice looking rainbow foil. These cards are not worth a huge amount of money, but can be easily collected and enjoyed by player collectors. 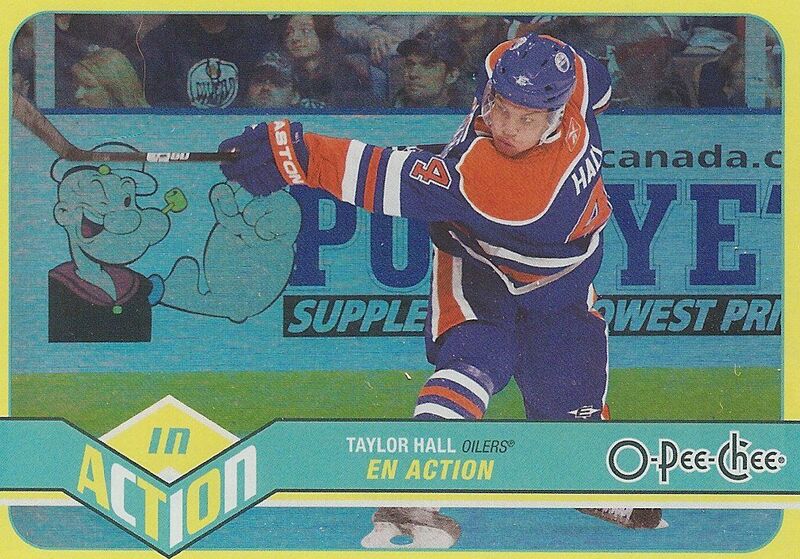 One of the nicest insert sets to come out of OPC this year are their In Action cards. These are released annually, but are always good looking cards. These cards feature the same foil as the foil parallels but with a different design. The yellow border of these cards is particularly eye catching. These cards come about one per box. There are short printed versions of these cards that come about one in ten boxes. The other inserts found in OPC come on standard card stock and feature things like team leaders and trophy winners. Lastly, there is a chance to pull game-used as well as autographed cards from OPC boxes. They are very difficult though. Looking at the odds on the back of the packs shows you that you have to be extremely lucky to get one from a pack. The autographs and memorabilia cards are nicely designed - they are neat and clean. Getting a memorabilia or autograph card from a product like OPC is especially exciting because of these difficult odds. 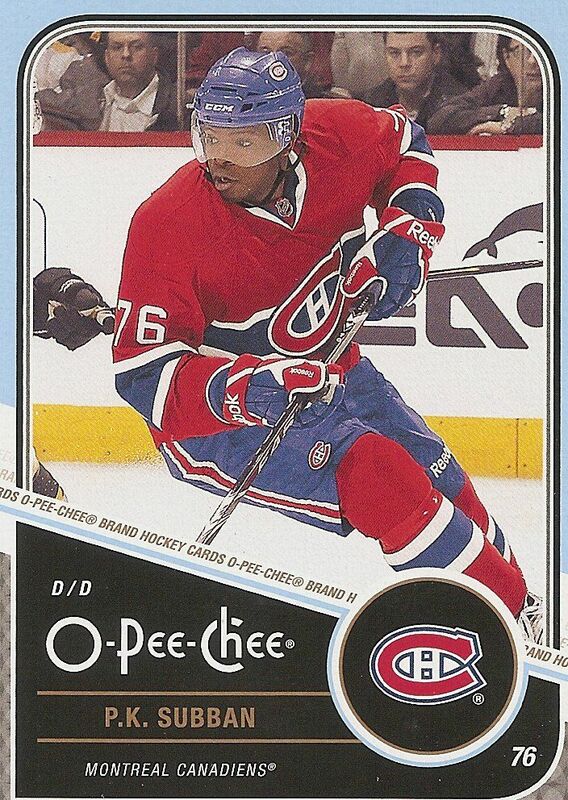 At around or under $60 a box, O-Pee-Chee is a wonderful product to crack open. It's one of the few products now that give the the opportunity to open a lot of packs out of a box - so many boxes now feature only a few packs within. I found it fun to see all the retro cards and pull foil parallels from the packs. It's definitely a product that can surprise you too. There are fun things to find such as blank backs and tough autographs. This is a product that collectors of all ages can enjoy. I would not hesitate to recommend this year's OPC for purchase. A very solid product this time around! Watch me open up a box of 11/12 O-Pee-Chee Hockey! The retros look like an homage to the 1930s OPC sets. There are traces of a couple different sets, though it's closest overall to 1935-36. Those cards were often issued with multiple different background colours. There was no real hierarchy to them. I hate the backs of the base cards. OPC never made a back that lame. Normally the most notable thing about an OPC back was the colour. They were bright. There was always something to see, even after they gave up on the cartoons in '81-82. Yeah, I like the beards and the retro. The base set is OK for me, but I don't think I'll chase after the shiny cards or the other inserts.